LittleBigPlanet 2 has been out for two years now and over that time seems to have had more DLC than the entire Wii catalog combined. 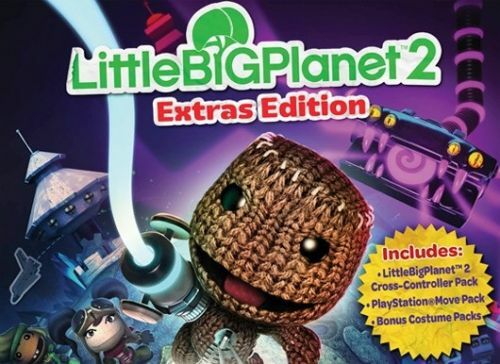 It is hard to know what to buy and what to miss; thankfully Media Molecule have removed this tricky life decision and created the LBP 2 Extra Edition. This new retail version of the game is coming soon and will contain the original game, plus a 'best of' selection of DLC. The most prominent extras on the disc will be the previously download only Cross-Controller Pack and Move Pack. With this DLC you can use your Vita or Move to control the action on TV. Also included are a couple of extra mini campaigns and the Muppet DLC. LBP2 may be an older game, but it remains one of the best family co-op games available on the PlayStation 3. Co-Optimus gave it the full 5 out of 5 in our review. Although it may not feel like it now, the PS3 will be with us for many years to come, as younger children are given the future PS3 Mini for Christmas, this Extra pack will be an ideal starter kit for 4 player co-op. • Cross-Controller Pack: Rescue a band of good-natured pirates and travel across the Omniverse using brand new PlayStation Vita Cross-Controller gameplay in search of a fabled treasure. • Move Pack Rise of the Cakeling: Something evil is baking and only Sackboy can stop it using the Brain Crane and his new PlayStation Move-enabled powers. • The Muppets Premium Level Kit: Join Kermit, Miss Piggy, Gonzo and the rest of the Muppet gang to put on the ultimate Muppet Show for LittleBigPlanet... Just don't let the mysterious theatre Phantom ruin the show for everyone. This adventure will have you running up walls trying to stop him, literally!